Sweet innocent George, and he left us some of the most beautiful words and wisdom. with every mistake we must surely be learning...still my guitar gently weeps. He died too soon but he left us love, words, sounds, wisdom. The love that lies dormant that we are afraid to wake as it might challenge our lives, it might change our lives. We fear change, we fear a challenge. Better stay unhappy but safe. But if tomorrow never comes...sing with me. Two friends, Eric and George, on stage, in front of thousands, but yet alone, just the two of them, the guitars blend into one as the notes rise to heaven in a perfect melody. The guitars gently weep. Two friends. And then one is gone and the other remains on stage, alone, taking over the role of his friend, surely we must all be learning, while our collective guitars gently weep. And Santana adds his delicate sensual guitar playing into the mix as the guitar becomes an extension of his hands, of his very Spanish soul. With every mistake we must surely be learning. Music transcends all, and all are united. He looks at us all and sees so much love that is sleeping, waiting for the light of day, waiting for the souls of angles to bring it life, to bring life to our life, to shine the sun on us. Here comes the sun....let it shine on you, wake up the love that is sleeping. Why did someone control you? Who is controlling you? Do you even know? I look at the world and I notice....we observe and we feel the pain that is there every day, and we try to bring some light. There is something in the guitar solo, the soul of the musician, the poet, the creator. Let lose, no longer be concerned over what impression you are making or about to make, to be free. To be free is not to be concerned what lesser creatures think. A friend is gone, a soul is missing, how much life and love have we missed during our own lives? No one alerted you that it is so easy to lose a loved one, so easy to lose love unless you guard and nurture it. "Love has a nasty habit of disappearing over night" (John and Paul). I look at you all, see the love there that's sleeping, and I wonder, why let it die? If we do not weep then the guitar weeps for us. And the music cries out to heaven. Play it George, play it Eric, play it Carlos. And the world keeps turning but we are just transient passengers seeking to make the most of our journey. How sad when we throw away opportunities. For the love there that's sleeping, still my guitar gently weeps. And we thank you for the music and the love. 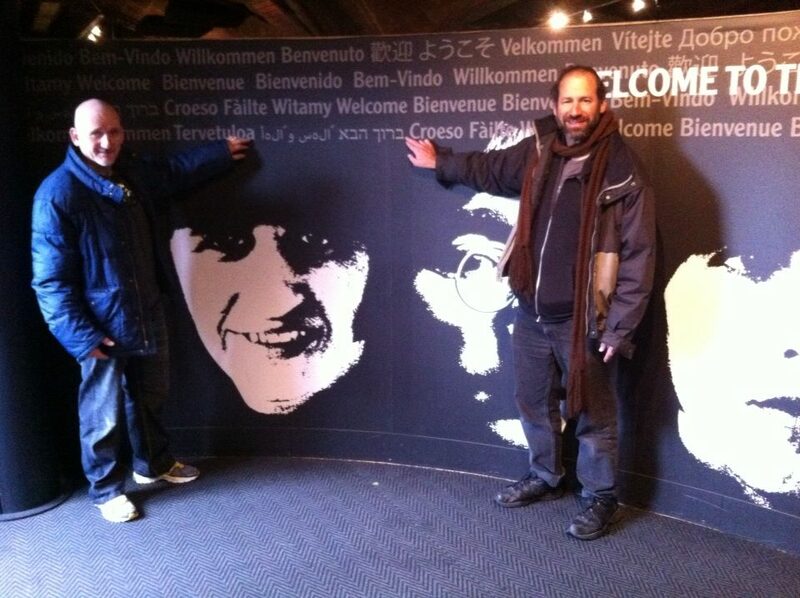 At the Beatles museum, Liverpool, England.